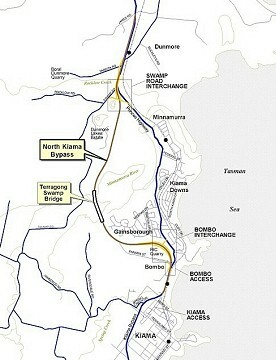 The $141 million, 7.6km North Kiama Bypass on the Princes Highway near Dunmore will improve safety and travel conditions by eliminating a winding section of the Princes Highway at Minnamurra as well as removing through traffic in residential streets in Bombo, Kiama Downs and Minnamurra. The North Kiama Bypass is to be built in two stages. A 942m-long concrete bridge across the Terragong Swamp was completed in February 2003 as stage one of the project. The bridge was constructed first so it could be used as a haul road for further project works. A contract for construction of the final stage was awarded in August 2003, with work starting in November 2003. The bypass is being funded by the NSW Government, with the Commonwealth Government contributing $34 million to the project. The North Kiama Bypass will be four lanes (two in each direction) which will bypass an existing section of the Princes Highway between 28.5km and 35km south of Wollongong and will extend from near Swamp Road to Bombo Beach at North Kiama. The Clyde River Bridge is a multi span steel truss bridge comprising one lane in each direction. It contains a lift span to allow the passage of boats underneath. The bridge requires deck strengthening. This work has been programmed by RTA for 2003 at a cost of $250,000. There is no alternative route. The Wagonga Inlet Bridge at Narooma is a multi span steel truss bridge comprising one lane in each direction. There is no alternative detour for heavy vehicles. While the bridge is strong enough for B-Doubles, the northern approach comprises a tight sub standard radius bend which results in heavy vehicles crossing the centre line of the road to drive on to the narrow bridge. Major improvements to the alignment of the northern approach will remove the impediment to the use of B-doubles reducing the potential for serious damage to the bridge structure. The project will eliminate an accident blackspot. These works are programmed by the RTA for 2002-2004 at a cost of $4m. The Brogo River Bridge north of Bega is a steel girder bridge built in 1937 comprising one lane in each direction. The southern approach to the bridge comprises a tight sub standard radius bend (35kph) which results in heavy vehicles crossing the centre line of the road to drive on to the narrow bridge. The current low level timber bridge is scheduled for replacement at its existing level. The timber structure is a serious constraint to heavy vehicles. The road cannot be opened to heavy vehicles for several days after heavy rain because the bridge needs to be inspected and often repaired after each flood. The Government has undertaken to provide 50% of $9m project cost, subject to matching Federal funding. All spheres of government have invested significantly in the economic development of the area. Public investment in enhancing dairy processing and the extension of the Eden wharf facility to accommodate commercial activity are undermined if Highway infrastructure remains unreliable. As a result of investment by Bega Cheese and arrangements with Bonlac, there has been a 400% increase in raw milk from Gippsland to Bega. It is hoped that this will continue to increase over the next five years. The efficiency of “just in time” processing depends on a reliable Highway. According to VicRoads, the largest single road movement of agricultural and rural products between Victoria to NSW is from East Gippsland. Pambula Bridge is an important but weak link in the network serving East Gippsland. The current usage is 5,500 vehicles per day. Flooding of the Pambula Bridge causes severe social and community disruption, because many community facilities (hospital, schools, shops) are on one side of the bridge, while many houses are on the other. Supplies of fuel and other essential commodities stop. Heavy or threatened rain seriously disrupts the substantial tourist industry. Access to Merimbula, a major holiday destination for many Victorians, is across the Pambula flood plain. A by-pass of Berry will improve traffic efficiency and reduce the number of vehicle and pedestrian conflicts. The bypass has been estimated to cost $30m and is programmed for 2006-8.